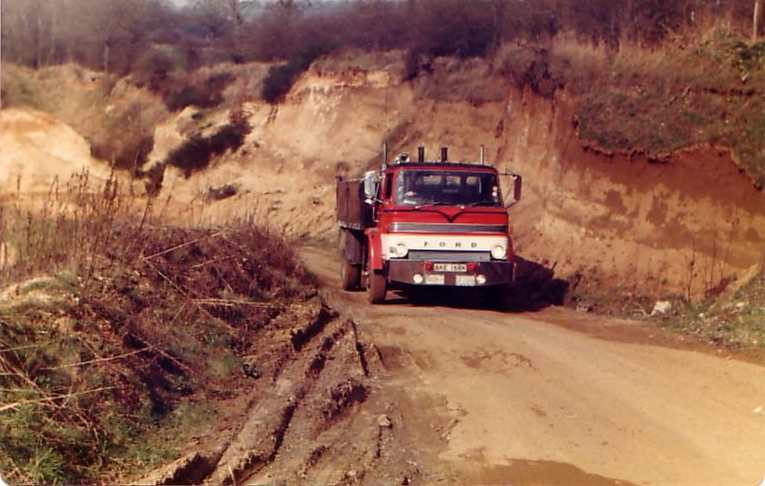 After working for some years in haulage, construction, gas-pipelines and quarries, I set up on my own with a single tipper, and MIKE TAYLOR HAULAGE was born in Borough Green, Kent, with the office work done by my wife Jackie. 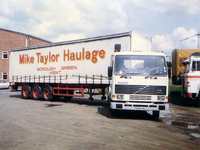 Over the years we moved to Platt, Aylesford and Paddock Wood, and went through a couple of name changes, to TAYLOR LOGISTICS LTD, and after my bankruptcy, my wife set up CAST TRADING LTD and employed me as a driver for a single truck. I have always loved driving, and I suppose trucking was hereditary, because my Dad was a truck driver at home in Canada, where I spent the first few years of my life. 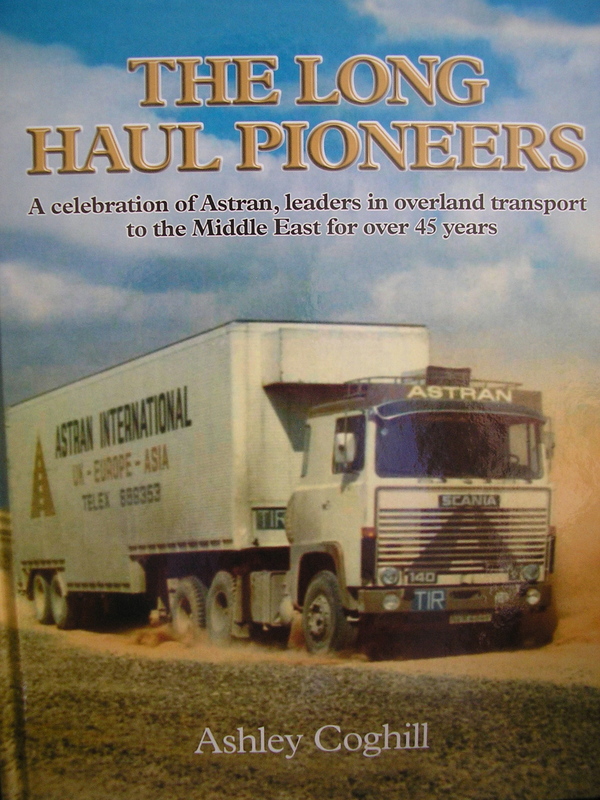 During my 6 years in the Army, I was known as "cab-happy", and had a lot of practice in everything that the Army had, from Landrovers and Austin Champs up to the Mighty Antar. In between were more conventional Bedford QLs and RLs, Canadian Fords, Commers, Austin K9s, Morrises, and even a tracklaying 432 Armoured Personnel Carrier. ( They wouldn't let me drive a Chieftan). After the Army, I worked for Adams Bristow in Kingston on Thames, doing boat and machinery transport in a fleet largely composed of BMCs. Leylands and Dennises. My final truck there was a 16t BMC threepenny bit: yes the one with the "nose" sticking out the front to accomodate the big six engine, and didn't that extra weight on the front axle make it a dream to drive in London traffic on contract to Youngs Brewery at Wandsworth. I was poached by Youngs to drive a six wheeler Dennis dray. and I was part of the only teetotal crew, talk about funny looks at pubs! I had applied when I first came out of the Army for a job with Corrosion & Welding Engineering, and for some reason I must have stayed on their books for some years, but I eventually got the call, was trained as an Industrial Radiographer, and sent out in an Austin Gipsy LHD around various Gas Pipeline sites as a welding inspector. What a lovely job for a single man. living in digs around the country, fresh air, plenty of money, but most of all for me was all that PLANT!! Bulldozers, 360s, sideboom cranes, mobile cranes, Matadors pulling 40 and 60 ft poletrailers. Every lunchtime spent driving something different. My last pipeline was the Kemsing to Tunbridge Wells line, and we had our darkroom set up at Darkhill Farm, Ightham, and an account for petrol at Goddard's Garage in the village: and that's how I met Jackie: she was serving on the pumps, and 40 years later we are still together having been through more scrapes and cunning plans than we can believe. We settled down in Borough Green, and I got a job at the local quarry run by ARC. Grease monkey at first, then tipper and mixer driver, before taking over the Concrete Plant. Spent a lot of time helping out in the quarry (driving things, naturally). Then in 1977 I took the plunge and became an owner driver. Enough about me, hit the menu and look at the trucks and people that have kept me occupied for 30 years. 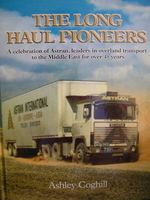 Whilst a Haulage Company is obviously about trucks and trailers, by far the most important ingredient is the people. We have been so lucky over the years, despite the rogues, vagabonds and scallywags we took on, often recommended by the local Police, we have always been blessed with loyal and hardworking people. The "problems" that crop up for an employer must be seen as a challenge, because every single human has some saving grace. Finding that saving grace and putting it to good use is the art of being a Guv'nor. This site is designed for Interent Explorer. Firefox users may need to load pages twice. (c) Mike Taylor all pictures unless otherwise stated : feel free to use any images, but if you earn I'd like a share !